We were expecting an exciting and strenuous day as we dropped down the rim through the dense forest and into Sunburst Canyon. What I was not expecting was the added challenge of being forced to complete almost all the rappels, (about ten in all) abundant down climbs and the long thrash through the thick on the exit hike using only my left hand. I am naturally right handed. I was on a short rappel with an awkward start early in the canyon when I swung hard right and crushed my right, rappelling hand against the rock wall. It was instant pain; sharp, raw and excruciating. Without letting go of the rope with my damaged rappel hand I safely made my way down to the bottom, but I knew I was in trouble. 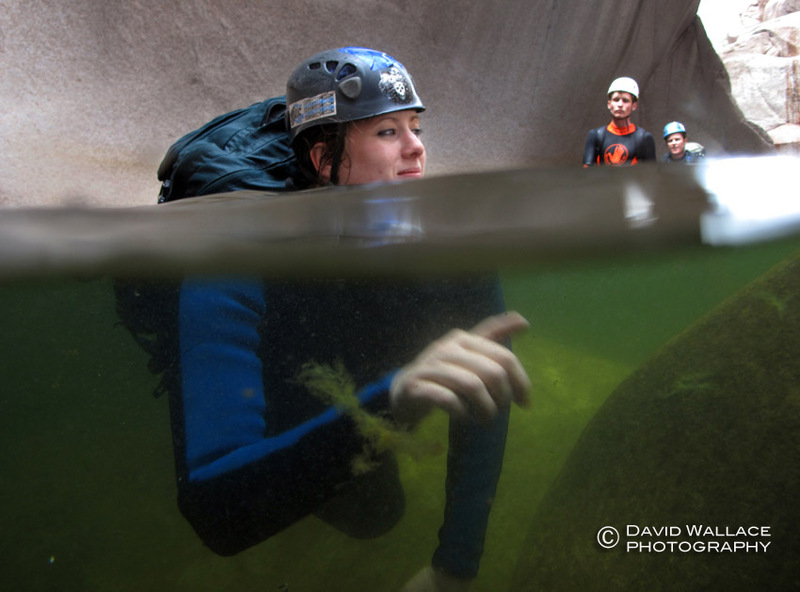 I took a breath and soaked my hand in the icy cold pool at the bottom of the rappel for some relief. After sitting for a few minutes it became very clear my right hand was going to be completely out of commission for the rest of the day. Despite the overwhelming pain it did not feel broken, just a really bad sprain. David and I talked for a minute and I decided I would be able to manage the ten or so upcoming rappels with my left hand. In the end using my left hand wasn’t too awkward, although I wouldn’t want to do a 300- foot rappel with the opposite hand, but now I know if I was forced to do it I would be able to. The most unfortunate part of my hand injury was that I really didn’t appreciate the beauty of the canyon, which Sunburst had a lot of, with trickling flow down sandstone drops into clear pools surrounded by a magnificent forest. When the technical descent ended the one handed adventure continued as we slogged for several hours through super dense bush back to the rim above. In canyoneering I can say with experience two hands is definitely better than one. David gets off rope at the end of a rappel down trickling flow. Laura rappelling with her left hand. Laura taking in the narrow walls. Mike traverses the wall to stay dry. When my sister, Abby told me she was coming to visit us in Arizona along with her British boyfriend, Gavin I was excited because the time of year was perfect for a descent of the Jug of Salome Creek. David and I took David’s sister and father down the Jug last year, so I was looking forward to sharing the experience with my sister. 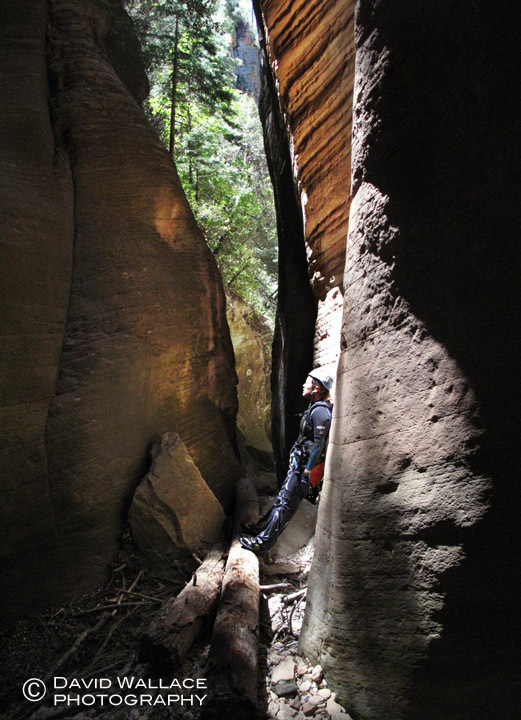 I hold a special place in my heart for the Jug because it is the first technical canyon I ever did before I even knew what canyoneering was and it is the first place I ever rappelled. After that first time, David and I were immediately hooked on canyoneering, so it is awesome when we take newbie friends and family who get just as excited about the sport as we are. As we geared up at the trailhead, David noticed the faint sound of air hissing out of one of our tires. It would be the second time we have gotten a flat tire from the dirt road approach to the Jug, a road that is well graded but covered in tiny, razor sharp rocks. Not allowing it to ruin our day we decided to deal with the flat after we returned and made our way to the canyon under an intense sun. Clad in their wetsuits and helmets, Abby and Gavin were all smiles from the very start of the adventure. In my opinion, some of the most fun parts of the canyon are in the beginning with all the natural water slides, pink canyon walls and clear, deep, pools that were very comfortable on this day. Before the one and only rappel we took a quick break to go over rappelling 101 with Abby and Gavin. They both seemed a little nervous and a lot excited. I went first so I could get photos of Abby and Gavin as they rapped down. It was really cool to see the pride and sense of accomplishment Abby had as she made it safely into the water and off the rope. As we sat and ate lunch looking back at the mouth of the canyon Abby said that going down the Jug was one of the coolest things she had ever done. It doesn’t get much better than that. Laura helps Abby negotiate an obstacle as Gavin looks on. Gavin, Abby and David just above the rappel. Abby (left) and Gavin rappel. Abby smiles while watching Gavin rappel. Gavin swims in the long pools towards the end of the canyon. 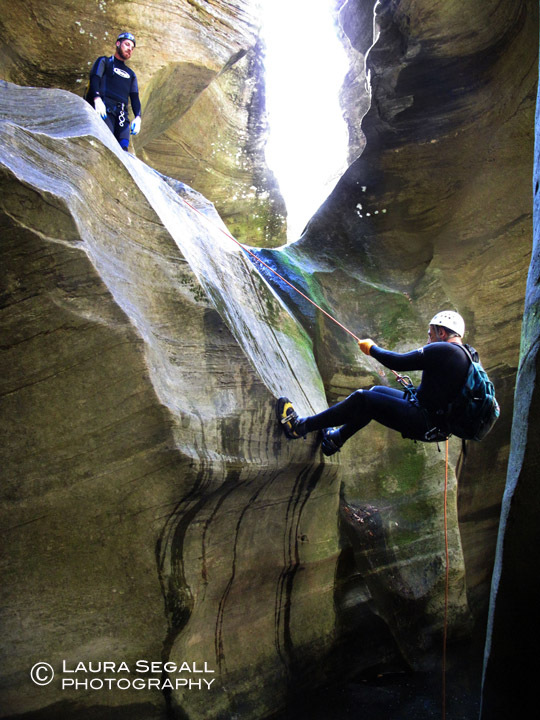 When my parents come to visit from New Jersey it is a great opportunity to take my father, Lee, canyoneering. It was my Dad who introduced me to the great outdoors when I was only four years old, taking me hiking in the Catskill Mountains in upstate New York. This time we wanted to change things up and try to also include my mother, Marsha, in the plans. Even though my mom was not going to participate in the descent of the technical canyon, I came up with a trip so she could still be part of the day. Bear Canyon, which I have descended twice before once during the day and once at a night, is a side canyon of West Clear Creek. It has a beautiful set of narrows with few technical challenges. The entire trip can be completed in three to five hours. Once Bear Canyon meets with West Clear Creek, a very short jaunt upstream leads to a steep trail that takes you out of the bottom of the canyon and back to your car on top of the rim. Outfitted with a lawn chair slewed around my shoulder and carrying a small cooler I walked with my mom and our Boston Terrier, Briscoe, down the trail to a sandy beach along the banks of West Clear Creek, which couldn’t have been clearer. My mom got out her book and her iPhone to play Sudoku as Briscoe jumped in her lap. After assuring her that she would not be killed by a mountain lion or mountain man, I pointed in the direction of the creek we would be coming from and told her we would see her in three to four hours. I then raced back up the trail, joined my Dad and Laura and we descended into Bear Canyon. As I said before, Bear Canyon is short, sweet and rather easy. Today, however, would be a little more challenging than normal because of the combination of the harsh winter we experienced and it still being somewhat early season for technical descents in this area. This meant for extremely frigid water in a canyon that normally has cold water in the middle of summer. Expecting these conditions we came prepared with 7mm wetsuits, which were much appreciated as we descend past blocks of ice and large patches of snow, which I suspect, will linger for several more weeks. The canyon was way more beautiful than my last descent of this canyon, which I did at night. We reached West Clear Creek and saw my mom and Briscoe still relaxing on their beach. I was relieved to see that neither the mountain lion nor the mountain man hadn’t gotten them. Probably Briscoe kept them at bay. Lee swims in very cold water. Lee and David, father and son. Lee negotiates a giant downed log in the canyon. Lee at the start of a short rappel. Laura tries to warm her hands as Lee looks on by a substantial snow patch in the bottom of the canyon. Lee and Laura meet Marsha and Briscoe at the bottom of West Clear Creek. Lee and Marsha hike up the trail out of West Clear Creek.